BlogTube Blogger Template is one of the best theme that’s especially comes for Video bloggers. If you own a website that contains videos content then this template is one of the best theme for your website. The blogtube blogger template comes with fast loading design that will help you to make your website super fast. It also has a responsive design that will load your website from different devices around the world. If you’re looking for a professional looking blogger template for your videos website. 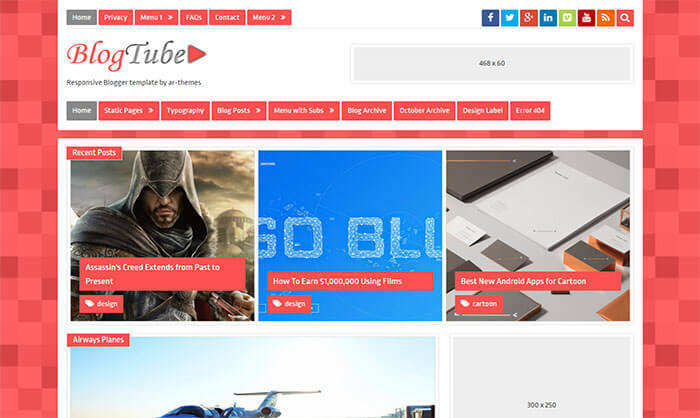 Then blogtube is going to be your first choice because you can’t only make your site beautiful by using this template. But you can also increase the revenue of your website. As if you take a look at the demo version of this template then you can see that it has different ad spots that you can use to display ads on your blogger blog. Another great advantage of using this blogtube blogger template is that it comes with SEO friendlydesign. It means if you don’t have good knowledge about optimizing your template for on page SEO then this template is best for you. Because it’s already optimized for on page SEO. All you need to do is to make your desired changes in it and modify it according to your needs.